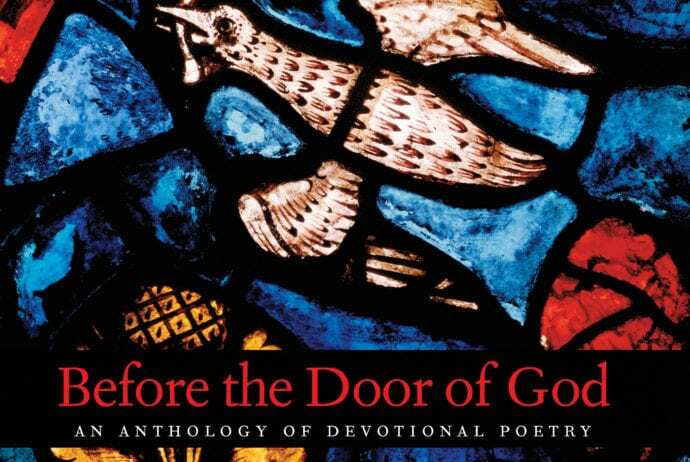 Before the Door of God: An Anthology of Devotional Poetry edited by Jay Hopler and Kimberly Johnson, Yale University Press, 2013. Much like its close relatives the prayer and the hymn, devotional poetry is by its definition interrogative; and by the nature of its presumed audience a devotional poem must always in some sense remain unanswered. As one of the great genres that are primarily written in the second person, the devotional poem is an exercise in addressing the ineffable. Even more importantly, this anthology begins to identify and classify broadly contemporary poets working within a new tradition of devotional poetry that could be called the “New Liturgy,” devotional poetry which takes the fragments of past verse and concepts from antique theologies to fashion new questions about what it means to live with faith and in the absence of belief in our moment. In the early seventeenth-century, George Herbert asked, “Who says that fictions only and false hair/Become a verse? Is there in truth no beauty? Is all good structure in a winding stair? /May no lines pass, except they do their duty/Not to a true, but painted chair?” Hopler and Johnson use Herbert’s poem “Jordan (III)” as an epigram in Before the Door of God and it’s an appropriate choice. The poets of Herbert’s day (and perhaps ours as well) had to defend their works against the accusation that they obscured the truths of doctrine and faith. Indeed, poetry has often generated an anxiety in the minds of all stripes of believers. It was Plato who first exiled the poet from his Republic, and from the classical Greeks to our own time there has often been an antagonism between the two cultures of those who believe that the truth should be clearly stated, and those who feel that the possibilities of language could be a tad more malleable. For those that warned about poetry, such writing was, for them, an adept form of lying, a borderline magical ability to construct entire worlds from mere words and to potentially lead people astray. For this reason, there has always been a central tension in devotional poetry: how can such an ambiguous and thus dangerous form express the truths of God? Plato’s influence is long, and poets of the past centuries have found themselves defending the usefulness of rhetoric and poetry as instruments for the religious. Herbert’s distant relation Phillip Sidney defended poetry in his ars poetica a generation earlier, arguing that one of the great strengths of literature is that it “affirmith nothing.” Indeed one of the pleasures of reading through this anthology is that, whether or not you are a believer, you discover that the best religious verse is free of the chains of doctrine, and, rather records the singular subjectivities of experience. As a type of lyric poetry, devotional poetry at its best is an individual’s plea to God – not simply a recounting of dry scholasticisms. Before the Door of God is in many ways its own ars poetica, assembling over 2,500 years of poetry to demonstrate precisely how varied and powerful devotional poetry can be. It is by necessity (though perhaps a bit disappointingly) an overwhelmingly Christian collection. Yet the editors are prudent and helpful enough to trace the geneology of devotional lyric back to its classical and Jewish origins, beginning the collection with several psalms, biblical sections including portions of Jeremiah and Job, as well as classical precedents such as Sappho and Lucretius. It’s refreshingly ecumenical to see something like Anacreon’s hymn to Dionysius in a collection alongside more traditional devotional verse, and it would have been a stronger statement if this nod to religious pluralism had been maintained in the later sections of the book. Hopler and Johnson have made sure to include selections from almost any major devotional poet you can think of. In chronological order (this is a small percentage of the overall) one finds Donne, Herbert, John Milton, William Blake, Samuel Taylor Coleridge, Walt Whitman, Lord Tennyson, Emily Dickinson, Gerrard Manley Hopkins, W.B. Yeats, Robert Frost, T.S. Eliot, Dylan Thomas, and Allen Ginsberg. Lest this sampling look a little-too dead, white, and male, the editors have made a conscious effort to include women poets across the time periods into which the anthology is divided. Increasingly canonical women poets from the Renaissance like Amelia Lanyer and Mary Cary, or the early American poets Anne Bradstreet and Phillis Wheatly are sampled from liberally. And in the more contemporary (and frankly more provocative) sections there is a conscious effort to try and balance male and female writers. Still, more inclusions from writers of color and especially more from non-Christian poets would have been welcome. By its very nature the strongest poetic section of the anthology is the chapter on “The Flourishing of the Devotional Lyric in the Post-Reformation Era.” It was in this era that the traumas of reform and the new controversies of religion lent themselves to what is inarguably the pinnacle of the devotional lyric as genre in the English language. An era that includes Donne, Herbert, and Milton presents an almost insurmountable achievement for the writing of religious verse. Ironically, it’s because of that fact, that this is one of the least enlightening sections of the anthology. The editors of course would have been almost ethically remiss to not include these poets, but excluding a few authors from outside of the canon almost everything on these particular pages could be found in any halfway decent anthology of Renaissance verse. What’s more interesting is seeing the devotional lyric thrive in eras where convention has it that religious expression should be moribund. For example, the collection makes a good argument as to the continuing importance of the devotional poem even among modernists. That W.B. Yeats with his occultism and his Celtic nationalism would gravitate towards the mysticisms of the devotional lyrics is not surprising, or that T.S. Elliot with his Anglo-Catholic royalism would embrace the form isn’t shocking. What may be more surprising are the devotional lyrics of poets like William Carlos Williams or e.e. cummings. A bizarre exclusion is the poet Hilda “H.D.” Doolittle, who is arguably the greatest devotional poet of the entire modernist movement (an omission all the stranger given that she is mentioned in the editors’ introduction). Though the earlier sections covering the sixteenth to the nineteenth centuries are a sort of “Greatest Hits” collection of religious poetry filled with familiar names, the post-modernist section is where the editors do their more creative work. What emerges in those later chapters is a contemporary cannon of devotional poetry that is illuminating when placed in its historical context. I would argue that the greatest contribution the anthology makes is not in store housing the brilliance of the past, but rather in beginning to identify the members of and the contours of “The New Liturgy.” These are the poets who have taken the religious anxieties particular to our own era and have begun to discover the language necessary to talk about divinity today. They have helped to invent the language that is much needed in an era where the certainties of the old faith are impossible. The very ineffability of God gives the incarnational language of devotional verse its power, and if faith has become a more ambiguous thing in our modern era, it has in many ways if not strengthened the possibilities for devotional poetry at least revivified it and pointed it in new directions that would have been hard to imagine in the past. Denise Levertov is at home with this new ambiguity. In her poem “Mass for the Day of St. Thomas Didymus” she writes, “I believe and/interrupt my belief with doubt. I doubt and interrupt my doubt with belief.” It’s a profoundly truthful representation of how the mind works. In our contemporary moment what evangelical doesn’t have their moments of doubt? And what atheist, no matter how strident, isn’t occasionally haunted by a God of disbelief? The new liturgy understands what all devotional poets have understood – affirming nothing does not mean that poetry lies. The great blasphemy is the attempt of the exegete and the theologian to define God, they are the ones in the business of forcing the infinite into the procrustean bed of limited language. Galway Kinnell in his poem “First Communion” writes of church that “Jesus, it is a disappointing shed/Where they hang your picture/And drink juice, and conjure/Your person into inferior bread – /I would speak of injustice, /I would not go again into that place.” The language of the fundamentalist – which by its very definition lacks poetry – attempts to force God into this “inferior bread.” The best of devotional poets understand that it’s in the ambiguity, the cracks and fissures of the certainty of faith, where God dwells. And indeed the new liturgy allows for what the critic Bernard Schweizer calls “misotheism,” that is the hatred of God. Charles Simic writes “Doesn’t it give you the creeps/To hear them begging to you on their knees, /Sputtering endearments, /As if you were an inflatable, life-size doll?” And the new liturgy knows that atheism is a type of belief in God just as much as it is a repudiation of Him. Charles Wright reminds us “Ancient of Days, old friend, no one believes you’ll come back” and Simic prays to “You in whom I do not believe.” Indeed accounts of God’s death may be overstated, and more importantly we may find that it’s irrelevant. After all, the earliest Christians already knew that there was great sacredness in an empty tomb. This is the most important continuity between the New Liturgy and the devotional poetry of the past millennia. The Russian critic Roman Jakobson argued that for language to be poetry it must draw attention to its own artificiality. Poetry is first and foremost about poetry, which is precisely what makes it the perfect medium in which to express feelings about the transcendent. Prose affirms, poetry does not. That is why it is a vehicle by which to approach a realm where language cannot positively express any literal truth. The poet – by always drawing attention to the artificiality of language – does less of a disservice to God than the crude literalist. The power of devotional poetry cannot even be neutered by disbelief. One can read through any number of literal minded religious tracts and easily disagree for any number of rational and provable reasons, but the devotional poem is not a religious tract. Its power is great, it allows us to be atheists in prose yet believers in poetry. Across the Abrahamic traditions there has existed a shadow theology that defines God by what He is not, the so-called via negativa method of understanding the divine. It is by its nature extra-linguistic, pointing beyond the surface world or words which can so easily become mental idols. And yet, humans are by necessity linguistic creatures. If God’s reality must exist beyond words then human reality can only exist through them. In this way the ambiguity of the devotional poem can express closer emotional truths about the experience of God than the theological tract or the work of exegesis ever can. The purpose of the devotional poem is to convert, and not just the penitent but in many ways God as well. It was in number 14 of his immaculate and perfect Holy Sonnets that John Donne asked God to “break, blow, burn & make me new.” As it ever was, this is still what the devotional poem at its best is supposed to do. Ed Simon is a PhD Candidate in the English department of Lehigh University. His research focuses on religion and literature in the seventeenth and eighteenth-century Atlantic world. He has been previously published in The Revealer, the Journal of the Northern Renaissance, and the Public Domain Review among others. Currently he is the assistant editor of the Journal of Heresy Studies, and one of the founding members of the International Society for Heresy Studies. He can be followed on Twitter @WithEdSimon.